why china is the largest electronic exporter of world? The People's Republic of China is the fastest growing major economy in the world with an average of 8.5 GDP growth rate. Economic experts predict china could overtake US economy by 2030. China is the world’s second largest economy right now. The $17.41 trillion U.S. economy is the largest economy in the world. About 20% of China’s exports go to the United States only. Near 25 % of exports from the country is electronic equipments such as computer products, Gaming & Entertainment electronics etc. Export industry in China shown 48% growth since 2010. The reasons for China's rapid economic growth is mainly due to country's export boom. 12 Foxconn ( world's largest electronics contractor manufacturer, largest suppliers of I phone, I pad, HP, Blackberry, Dell, Nokia etc) factories are in China itself which is more than in any other country. It is a Taiwanese electronics contract manufacturing company with 1.3 million employees, which is about 40% employers in United States Department of Defense. Thus, a major portion of Foxconn products is from Chinese factories. What are the reason behind this rapid growth in China's Export industry? China is the most populated country in the world with a population of more than 1.3 billion. The law of supply and demand is all the time fundamental of economics, When more people are willing to work than the jobs available, the labor goes down. Besides employment rate is higher in the country, China is 4th in position among top employment rate in a countrywise list. So Such a big country like china with higher employment rate double the total productivity. China is the largest recipient of Foreign Direct Investment with an average of $129 billion inflows. Highest population and Low labour costs in china are the foremost reason behind this larger inflows. China topped United states $17 Billion FDI during 2010-2013. Low corporate tax and tax holidays in Chinese economy making foreign companies invest in R&D and other manufacturing sectors. 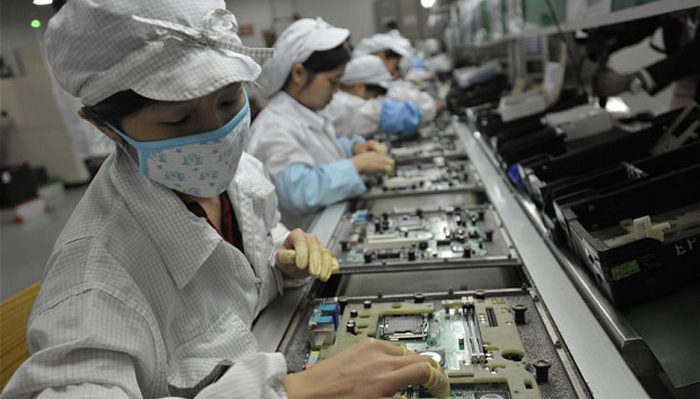 (3) Mass production of low-end electronics. Chinese manufacturers are making low-end electronics products rather than advance engineering products. Most developed countries are focusing on High-end technologies and complex products. When most European manufacturers are seeking highly qualified professionals for advanced researches Chinese manufacturers require low skilled employs. So the job opportunities are higher in china so as the employment rate. In addition, to the above reasons, there are some other factors influence the electronic market indirectly. United Nations reports says China is the largest e-waste dumping site in the world. 70% of electronic wastes in the world are ended up in China. A large number of people works in dismantling and recycling works even it is dangerous and toxic. Many more people are involved in different stages of electronic industry in fact. Hence, it is easy for a common man to gain knowledge about the electronic manufacturing and being a part of it.